Learning Spaces: Are Conventional Classrooms A Thing Of The Past? Academic research has shown that classroom environments affect learning, changing how schools approach classroom design. Creative, flexible spaces are being implemented in favour of traditional 'desk and chair' classrooms with great success. At Garden International School (GIS), students and teachers learn together in ‘dynamic learning spaces’. Inspired by leading experts in learning spaces like Elizabeth Jarman, teachers have designed and created learning environments aimed at nurturing a child’s creativity and skill development, stimulating their curiosity, and supporting their social and emotional wellbeing. At the school’s Early Years Centre (EYC), walls have been removed to create large, airy spaces populated by a variety of workstations where children can experiment and play. A smooth indoor-outdoor flow ensures children have easy access to outdoor learning stations and can even nurture their own vegetable gardens! In the Primary school, teachers have researched the impact of light, colour and noise on learning and have made changes to the classrooms accordingly. Wherever possible, children have input into creating classroom environments – one class chose to try sitting on fitness balls! Between classrooms, there is a ‘Green Space’ with artificial turf and natural materials to explore, as well as comfortable ‘living rooms’ where children can rest, read or chat with friends. In Secondary, the ‘Learning Hangout’ is an innovative, tech-friendly space with comfortable seating, plants and natural light. As well as being used for some lessons and CCA clubs, students come here during break and lunchtimes to socialise or play board games. This flexible learning space has proven very popular and the school is now looking to develop similar spaces. 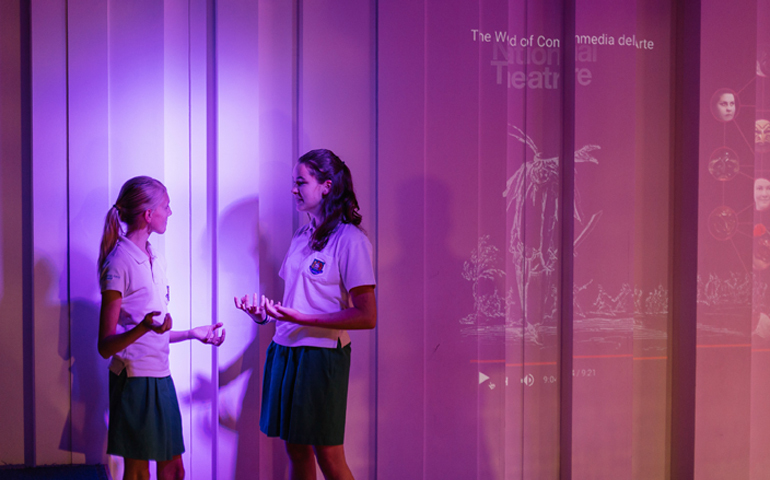 This innovative space uses a magical combination of LED lighting, videos and sound to create settings that transport students into the text or topic they’re exploring. Science teachers have used it to re-create the inside of a beating heart; History teachers have recreated scenes from World War I; English teachers have brought Shakespeare’s plays to life. Primary teachers regularly use the space to create exciting environments designed to stimulate students’ imaginations and inspire them to produce great writing. “You really can bring the outside world into the room, which inspires our students to ask questions and get excited about learning,” enthuses Secondary Drama teacher Andrew Rankin, who led the development of the innovative learning space. He is one of three Apple Distinguished Educators at the school and is proud of the way the immersive learning environment has given GIS teachers a new way to engage and motivate students. GIS has been internationally recognised as an Apple Distinguished School – a prestigious global award that was granted in recognition of GIS’ “innovation, leadership and educational excellence”. Find out more about GIS’ innovative learning culture and book your bespoke tour at www.gardenschool.edu.my or call +603 6209 6888.